What is an elastic material? Why does stretching a spring involve doing work? How is energy stored in an elastic material? Does a compressed, bent or stretched elastic material always return to its original shape on releasing the tension? How do you calculate the potential energy stored in a spring? What is the relationship between the extension of a spring when increasing weights are connected to it? How can we investigate the relationship between a spring's extension and weights added to it? When a material is subjected to two equal and opposite forces they may change the relative positions of the particles i.e. may change its shape. This is what happens if you stretch a spring or rubber band, squash moulding clay or bend a strip of plastic or metal. If the forces are removed different materials behave in different ways. The spring or rubber band are likely to return to their original shape and length, displaying their elastic properties. The clay will stay in its new shape. The plastic strip like a ruler may return to its original shape. A strip of the soft metal like lead will be permanently deformed but a strip of strong steel, if not bent too far, is likely to return to its original shape - this happens with a clock spring in a clockwork clock. Materials which have a tendency to return to their original shape are called elastic. Those that do not are referred to as inelastic (non-elastic). The more elastic a material, the greater its ability to regain its original shape. Engineers designing structures like bridges need to understand the different ways forces operate. When the applied forces stretch materials the material is under tension. If the applied forces squeeze or compress the material, it is described as being under compression. In a bridge, the supports on either side are under compression but the main body of the bridge carrying traffic is under tension - this could be the roadway and/or the cables in a suspension bridge. If you want to bend, stretch or compress an elastic object you must apply a force. As explained above an elastic material is one that can be deformed in shape by applying a force and returns to its original shape if the forces are removed - springs and rubber bands clearly exhibit elasticity. If an object doesn't return to its original length and shape it is inelastic. The extension of a simple spring by stretching it with an applied force can be used to illustrate these points. Initially the extension of a stretched spring is proportional to stretching force applied (e.g. adding increasing weight). This simple law is obeyed until you reach the limit of proportionality (L on the graph) - in other words the graph is linear up to point L.
After that, between point L and point D, the stretching is greater than expected - non-linear graph, but the spring will return to its original length - the spring is still behaving elastically, but only for a relatively small further increase in the applied force. However, if you overstretch an elastic material it may only partially contract return to its original shape on removing the applied force, so the spring is permanently deformed. The point at which this first happens is called the elastic limit (point D on the graph). Beyond the elastic limit D, the greater the stretching force applied the greater the permanent deformation (from point D onwards) - the less the object returns to its original shape - this is seen on the graph as it curves over in the extension direction! When the object doesn't return to its original shape after removing the forces it is called plastic deformation. With some materials, the elastic limit L, is so low that you see little elastic behaviour and permanent deformation sets in quickly with a relatively small applied force. In these cases, the force - extension graph is a curve (non-linear) with virtually no linear portion at the start. In the process of bending, stretching or compressing, energy is transferred in the process, so work is done. In order to deform a material to be bent, stretched or compressed two forces must be operating, often in opposite directions. If only one force was involved the material would stay the same shape and just change position. Bending occurs when you wind up a mechanical clock. Strictly speaking on the 'outer' surface to the right the force is one of tension (stretching) and the 'inner' surface to the left, experiences compression (think of bending quite a thick plate, ok?). Stretching happens when you use a spring balance to weigh something or put a rubber band round an object. Older (still do?) 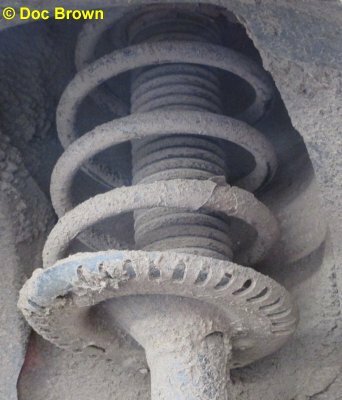 forms of car suspension use steel springs which compress on meeting a bump in the road to absorb the energy of the impact. 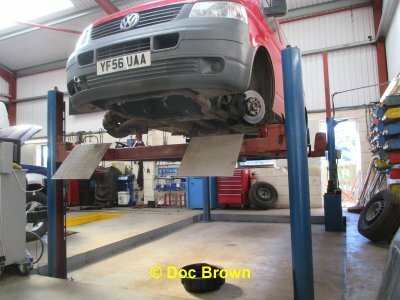 Rubber shock absorbers in the under carriage of a car have the same effect. 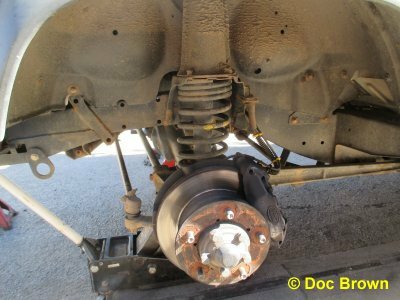 The large sturdy spring S of the wheel suspension of a Land Rover, which is expected to absorb the impact energy of some pretty hefty bumps! On compression, the stiff spring will store a great deal of elastic energy, if only for a brief moment in time! 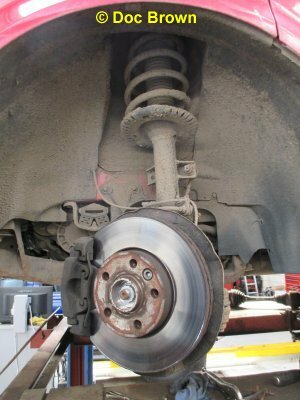 D = the brake drum and disc on which the brake pads in casing P are forced into contact with the smooth disc by hydraulic pressure when you press the brake pedal. 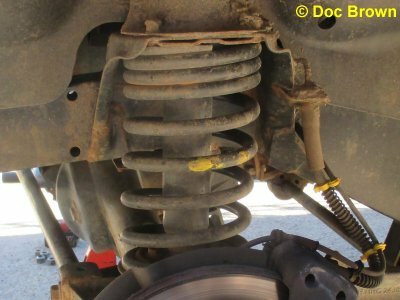 A double spring suspension on a red van, conveniently jacked up! An experiment to investigate the force applied to a spring and the resulting extension. If weights are attached to a firmly fixed suspended spring, the spring will elongate depending on the value of the weight attached. The greater the weight, the greater the spring is extended. The extra length the spring attains is called the spring extension and this phenomena can be systematically investigated using the simple apparatus described below. When a weight is added and the spring is static, the weight of the mass (and the spring itself) is counterbalanced by the force of tension in the spring. A metre rule is fixed in a vertical position using a stand and several clamps. Preferably with the linear scale pointing downwards! The metre rule scale can be read in mm or cm. From the top of the 1 m ruler a spring is suspended with a hook-base is added to which extra mass can be added e.g. in 50g increments (0.5 N force increase increment). Fix a pointer onto the hook to which the weights will be attached. If you can't fix a pointer on, just use the base of the weight hook and sight it horizontally onto the scale. You take the initial reading with no extra weight on (other than the weight of the spring itself plus hook) and take the initial reading on the scale. This first reading with no extra load applied is the crucial starting point for all the successive measurements. You then add an extra mass and take the scale reading in mm/cm. From each successive reading you must subtract the initial reading to obtain the true extension of the spring (I haven't actually shown this in the table of results below). Record a minimum of five observations carefully in a prepared table and convert the mm/cm scale readings to the extension in m.
Below is a typical table of results, already corrected by subtracting the 'initial' reading. For simplicity I've taken gravity as 10 N/kg, therefore every 50 g mass added equals an incremental weight increase of 0.5 N.
From the data table you plot a graph of total force (= tension) versus the total extension in the spring length (graph sketched on the left). (the tension in the spring equals the force created downwards by the weight of mass). Draw the line of best fit from the 0,0 graph origin. If the spring is truly elastic a linear graph is obtained. This means a simple linear equation describes the behaviour of the spring under these conditions. The experiment is a simple proof and demonstration that the extension of a spring or any elastic material is directly proportional to the force applied (the load or weight in newtons). and k is the spring (elastic) constant in N/m. The stiffer the spring (or any material being stretched) the greater the spring constant. This linear equation relationship between force applied and the extension (or compression) of an elastic material is also known as Hooke's Law of proportionality. If the deformation of a material is proportional to the force applied, the material is truly elastic and is said to obey Hooke's Law (a law of proportionality). The spring constant varies with the material of the spring, the size and number of coils of the spring. The stronger/stiffer the spring the greater the value of the spring constant k.
This spring system is the basis for simple instruments used to measure the weight of an object like a fish you have caught! A force meter is used for experiments in a laboratory - school, college, university or in the engineering industry where it is used e.g. to test the strength of materials. Above is an illustration of a simple instrument for weighing objects. It is essentially a 'force meter' calibrated to read in g and kg. Prior to taking a reading the pointer should be adjusted to read zero. 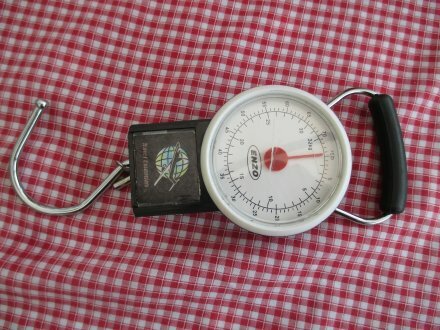 You place the object on the hook which stretches the spring and read off its weight on the calibrated scale. What happens if you keep on increasing the force applied to an elastic material? In the above experiment, if you add even more weights to the spring then the resulting graph of results may not be linear for the higher weight readings. This is because the spring is overstretched beyond its elastic limit (the limit of proportionality). Beyond point L Hooke's Law is no longer obeyed. In other words the non-linear section of the graph is beyond L, the limit of proportionality - the spring stretches more than you expect and the graph begins to curve over. From zero force to L Hooke's Law is obeyed - the linear section of elasticity. Just because an object behaves elastically, it doesn't mean that Hooke's Law is obeyed. An elastic band is 'elastic' but it doesn't obey Hooke's Law! Eventually at point D, called the elastic limit, the force is too great for spring will not return to its original length - permanent deformation beyond the limit of elasticity. This happens with a repeatedly stretched elastic band - eventually it breaks! From point D onwards the spring behaves with plastic deformation. On the right-hand graph, an alternative representation of the graphical data, I've indicated the permanent extension showing the spring will NOT return to its original length. Solids have a fixed shape due to the strong attractive forces between the particles. When the material is stretched so it cannot immediately return to its original shape, the forces of attraction still try to restore the particles to their original positions. In this process work is done on the particles in this separation and so potential energy is stored. If the restriction is removed (applied force released), particles can 'spring' back into position releasing the elastic potential energy - a good example is wound up a clock spring. Note: If the applied force is too strong and the interparticle forces are weakened too much, the particles cannot return to their original positions - so the shape is permanently changed - plastic deformation. Elastic potential energy is the energy stored when some material is stretched or compressed and the energy released when the constriction is released eg the wound up spring of a clockwork clock, a pulled elastic rubber band, stretched coiled metal spring, the compressed spring in a an animal trap, stretched bow before the arrow is released. Since elastic potential energy is a form of stored energy, it does nothing until it is released and converted into another form of energy. You can calculate the work done in stretching or compressing a spring = energy transferred = the energy added to the elastic potential energy store. This equation is only valid within the limit of proportionality, that is when the spring obeys Hooke's Law. Using the experiment results from above we can calculate the stored elastic potential energy for the 0.06 m extension of the spring with a load of 3.0 N.
You can actually do this calculation in two ways. BUT, you can also do the stored energy calculation from the graph of results using the graph above and the principle explained by the graph below. (b) Calculating the area under the graph of force versus extension. (ii) Method (b) does not involve the spring constant. Again, it should be pointed out that these calculations are only valid if the spring is not stretched beyond the elastic limit (limit of proportionality). Remember, force must be in newtons and extension in metres (cm/100 = m, mm/1000 = m). At a higher mathematical level (A level in UK) what you are doing via the graph is called an integration, here of the work equation W = F x d. BUT, you cannot use this simple equation to calculate the stored energy because for this equation to be valid the force must be constant, but for a spring the force must be steadily increased to increase the extension so please use Ee = 1/2 k e2 to calculate elastic potential energy! In terms of spacing in the lattice, the particles (atoms, ions or molecules) in a solid at equilibrium in terms of their spacing. These fixed 'balanced' positions are determined by the balancing of various forces of particle attraction (opposite charges) and repulsion (like charges). When you apply a force to a solid object you are pressing/squeezing the particles closer together giving rise to an opposing force of repulsion. To continue any compression requires a greater and greater force. When the compression force is removed the particles repel each other and move back to their original position if it is a truly elastic material. When an object is stretched you are pulling the particles apart from their normal stable positions and the attractive forces between the particles try to resist the stretching - force of tension produced. Therefore you are doing work on the system and storing energy in it as you stretch the material. If the stretching force is removed, and the material is truly elastic, the object will return to its original shape and length. Rubber materials have molecules that can actually be stretched at the particle level, straining the chemical bonds. These bonds can relax back to normal length and the object e.g. a rubber band or a steel spring return to their original shape and length. However, if the force is great enough, some of the bonds are broken e.g. with an overstretched rubber band, or, the particles shift position changing the structure in some way e.g. an over stretched steel spring where layers of atoms can slide over each other. This produces a permanent deformation when you go beyond the elastic limit of proportionality and Hooke's law no longer applies. Q1 A spring is fixed firmly in a vertical position. When a mass of 120.0 g is attached to the spring it extends in length by 3.2 cm. (a) Assuming the gravitational field strength is 9.8 N/kg, calculate the spring constant k.
(b) Calculate the extra elastic potential energy stored in the spring as a result of the added weight. 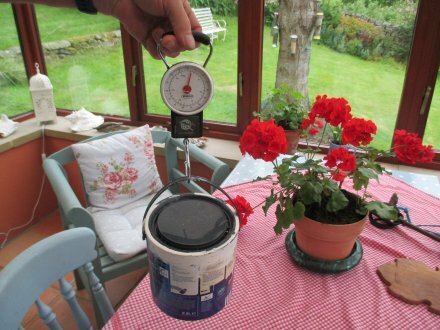 (c) If an extra 200 g mass is placed on the spring, how much longer will it get? (d) What force is needed to extend the spring by 30 cm? (d) What important assumption have you made concerning the calculations in (a) to (c)? You have assumed the spring behaves truly elastic i.e. within the elastic limit (limit of proportionality).